I can't believe it's only been 3 months since I first contacted you during the first week of March about making me gun . We had just gotten our last snow, and it seemed like forever before I'd have my fist Wong speargun, and even longer before the weather would permit using it. 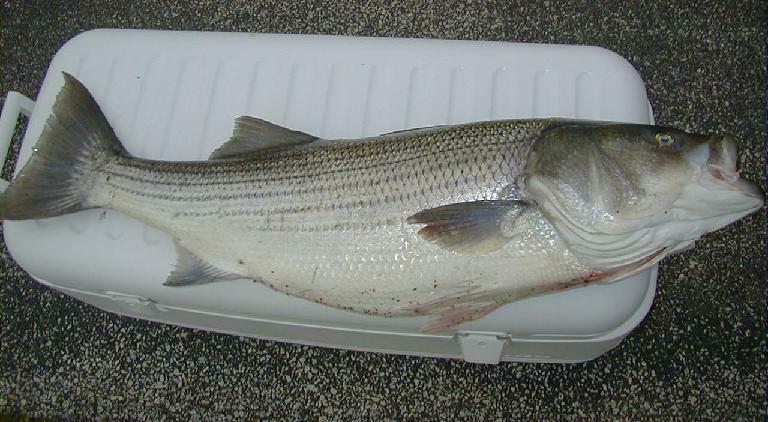 Early June proved to be a fun month hunting for Striped Bass here in South Jersey, thanks to these 3 Bass shot with my new 42" enclosed-track Nor'Easter hybrid. 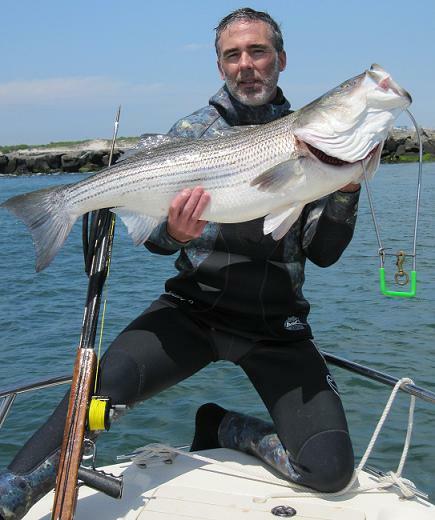 It was equally fun in April and May shooting tautog but the elusive and wary striper added a heightened level of excitement to the hunts. 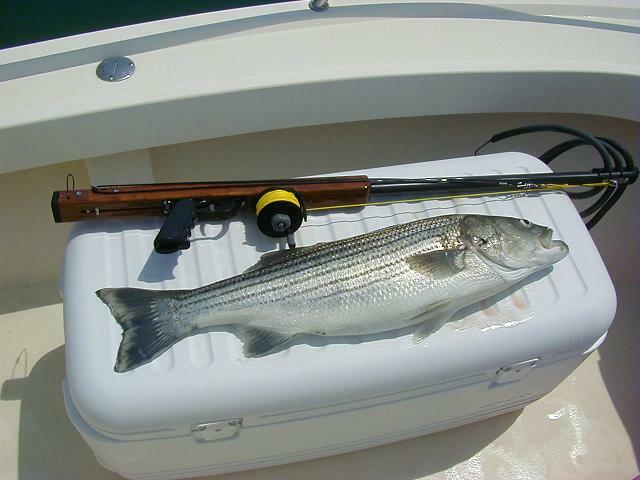 Only having prior experience with pneumatic guns, I soon realized just how instrumental this new gun actually was to shooting these evasive striped bass. 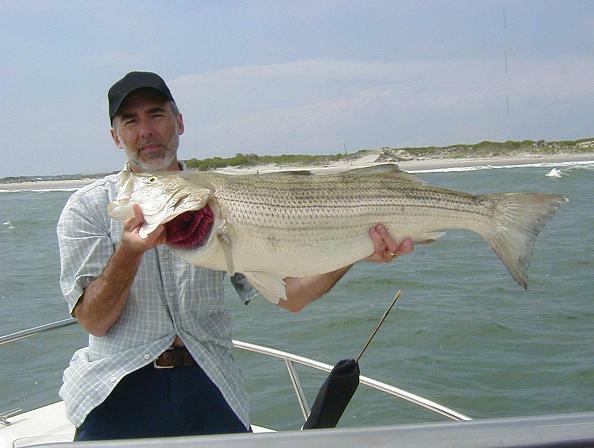 On two particular shots at a tog and a striper, the reel proved to be quite necessary in preventing the loss of the fish due to a marginal shot. If the fish were not allowed to take some line during their initial "burst" of energy, they would have torn off for sure. Even with the three 9/16" bands I had you tune "weaker" than the standard 2-band gun, I have not shot a fish yet that the 48" shaft did not penetrate completely through. I feel the gun has just as much power, if not slightly more, than your standard 2-band Nor'Easter with full-strength bands. It is also very easy to load without a rest-tab.I also love that 9/32" Hawaiian flopper shaft. It is so slender that it passes right through the fish with extremely little damage to the meat, and offers hardly any resistance to penetration. Now let me comment on accuracy. This gun seems to aim itself. I seem to merely just "think" of where I want the shaft to go and it hits! 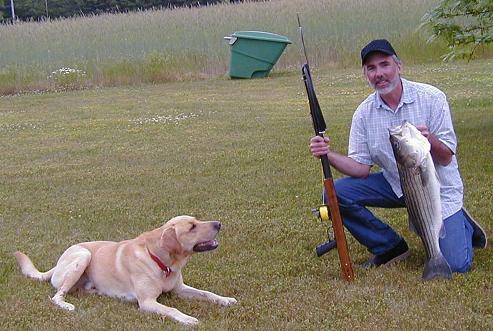 My stalking strategies are more to blame for too few fish than the gun. 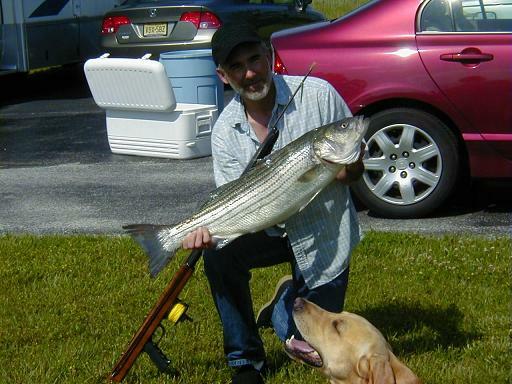 Every shot taken with this gun has landed a fish, with the exception of one. I can only imagine getting really familiar with it, and better at hunting. To sum it up, this is the perfect gun for our waters here. In what's considered our good "limited shore-vis", I hold the gun out at arm's length and the flopper hangs 5 feet from my eyes. The vis might be double that. In less vis I tend to hold it in a little closer and that seems to do the trick. I can't see going with any longer of a gun in our conditions, and also can't see going with any shorter of a gun either. 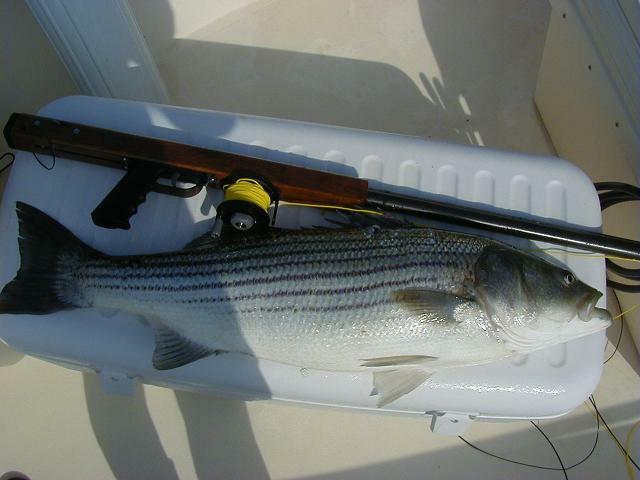 In my limited-experience opinion, this is the perfect gun for NJ waters. I have to add that everyone who sees this gun in person really admires the quality and workmanship. You're a true craftsman!